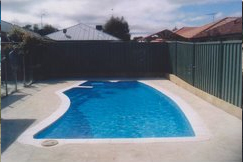 We remove an unwanted fibreglass swimming pool that is in good condition and take it to our workshop south of Perth for refurbishment. 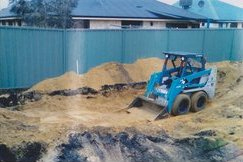 After you have chosen the shape, style and colour you want from our wide range, we excavate your backyard to make way for your refurbished pool. 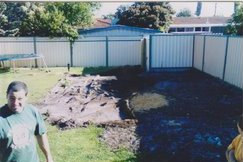 The home owner is left with a great space in the backyard, filled with good quality soil and ready to turn into something more suited to the family's needs. 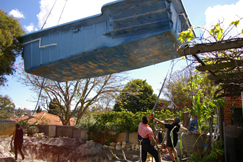 Your pre-loved, refurbished pool is brought to your home and lowered into your backyard by crane. 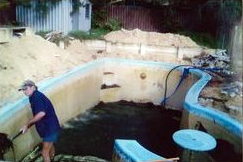 We sand back the pre-loved pool to create a smooth surface, then apply a fill coat, followed by a gel coating. This is all part of the restoration process, which includes extensive structural testing. 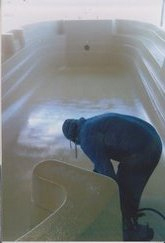 This coating means the refurbished pool is thicker and tougher than the original fibreglass swimming pool. We backfill around the hole, connect the plumbing and making sure the pool is stable, ready for filling with water. 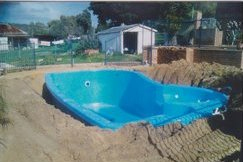 In less than two days since the bobcat arrived, your very own pre-loved swimming pool is installed - at a fraction of the cost of a new pool. Now all you need to do is complete the paving and landscaping so your backyard dream is complete.